Written by Nicole Kohler on October 9, 2015 Blog, Woo news. 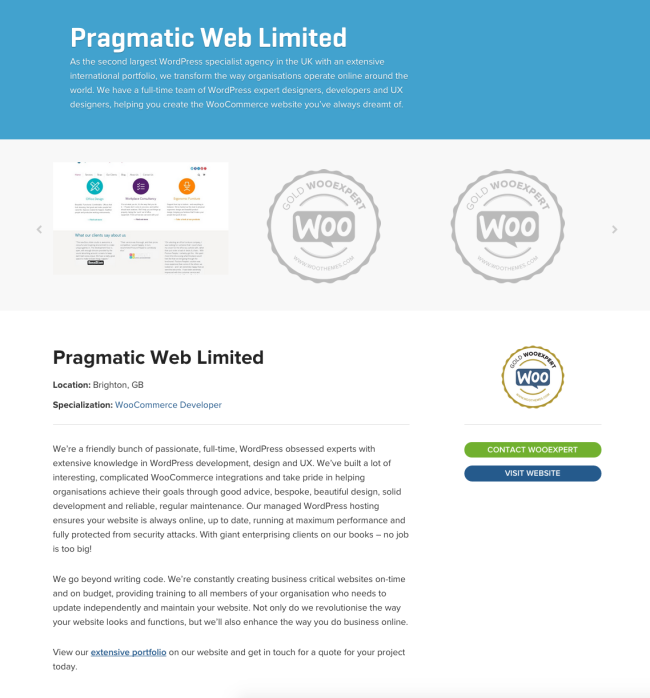 A WooExpert is a vetted and verified developer or agency specializing in Woo products. Each expert that applies to the program, regardless of the tier they apply for (more on that in a second) is carefully reviewed for this criteria. If they meet it, they’re accepted and listed. If they don’t, they aren’t. Before the WooExperts program came into existence, you might have seen our Affiliated Woo Workers page. Here, we basically listed every developer or agency that asked to be here, regardless of their experience. These pages ranged from incredibly detailed to minimal at best. You couldn’t filter by expertise (for example, if you wanted a WooCommerce expert vs. someone to customize a theme) and location filtering was also an issue. What an Affiliated Woo Worker’s profile page looked like. We knew we needed a change. We needed to give our customers a reliable, accurate way to find an expert in their area who specialized in what they wanted help with. We also wanted to get better at filtering our listings. There are plenty of companies who “dabble” in WooCommerce, but if we listed them all we’d have hundreds of pages. It made more sense to only list the ones who had experience, and were serious about partnering with us. From these two desires — to make the customer experience easier, and to list true experts — the WooExperts program was born. One of the biggest changes, and one of the things we’re proudest of, is the addition of an on-page portfolio. Customers will be able to browse an expert’s latest work right from the site. Also, our experts can add the work they’re proudest of, complete with details about the project, and we’ll display a live view of the homepage for all to see. 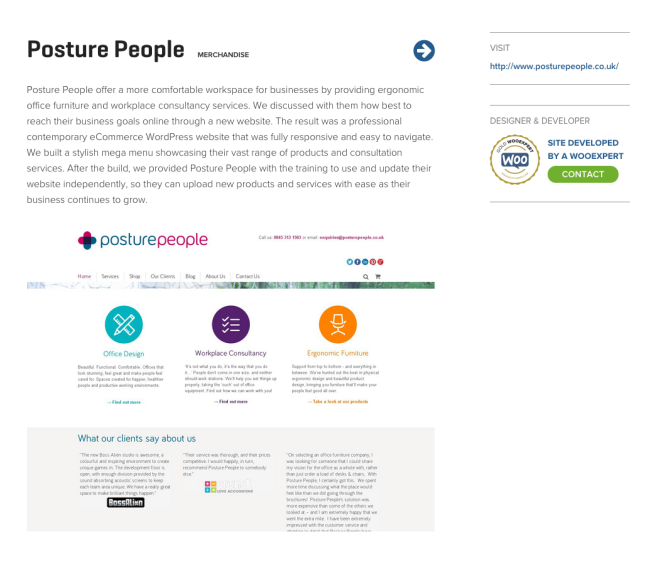 An example showcase site created by one of our very own WooExperts! Want to find an expert to lend a hand with your upcoming project? Easy peasy. Head over to our WooExperts page and click that green “find an expert” button. From this next page, you can filter by location and specialization (for example, WooCommerce, WooThemes, Sensei…), or simply browse through all the available experts. You can also see the experts we’ve featured for their standout work. If you’re considering reaching out to an expert for help with a current or upcoming project, we encourage you to check back again here soon! Are you a developer, agency, or WooCommerce expert who wants to join the program? Brilliant! We’d love to hear from you. WooExperts has two membership tiers: silver and gold. Each tier has its own perks and benefits, from a dedicated account manager to WooConf discounts to a special monthly newsletter with previews and first dibs on Woo news. WooExperts is something we plan to build on and grow long-term. It symbolizes our commitment to the developers and agencies who use WooCommerce, and are part of this great community. We will be dedicating these, and even more, resources to this program as time goes on. 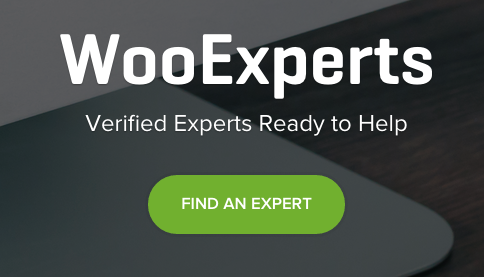 To learn more about all the perks of becoming an verified expert, head on over to our Join WooExperts page. Ready to sign up? Fill out the form and we’ll get in touch with you shortly. It’s our hope that with the overhaul to this program, it will be much easier to match experts with the customers who need them. Whether you’re in need of a partner to help you set up a WooCommerce store or want to list your agency so potential clients can contact you, WooExperts is the perfect solution for you. Check it out and let us know what you think! Have any questions about the WooExperts program? Or any feedback or suggestions for us? The comments are open and we’d love to hear from you, whether you’re a potential expert or a customer. This is awesome news! Our team has been hoping for something like this for a while now. We do think the program should entail a certain degree of competency testing, however, as it comes across as a sort of quality endorsement to end-users a la Google Adwords certification. As we are focused on managed WooCommerce (WordPress) hosting, do you also plan to include “expert” web hosts in your program that prioritize things like WC loading speed and security? I agree with LittleBizzy. You should have some sort of competency testing. Can you tell us more about what a typical referral looks like? Are the projects solely development or are some full strategy/creative/development projects? Overall this program sounds great, but most projects we take on are full engagements and not just development, so would be great to know if the potential clients are in need of the full range of help or just coding. Great question. The projects are not solely development. It’ll depend on the customers requirements and how well detailed the descriptions are in the profile. 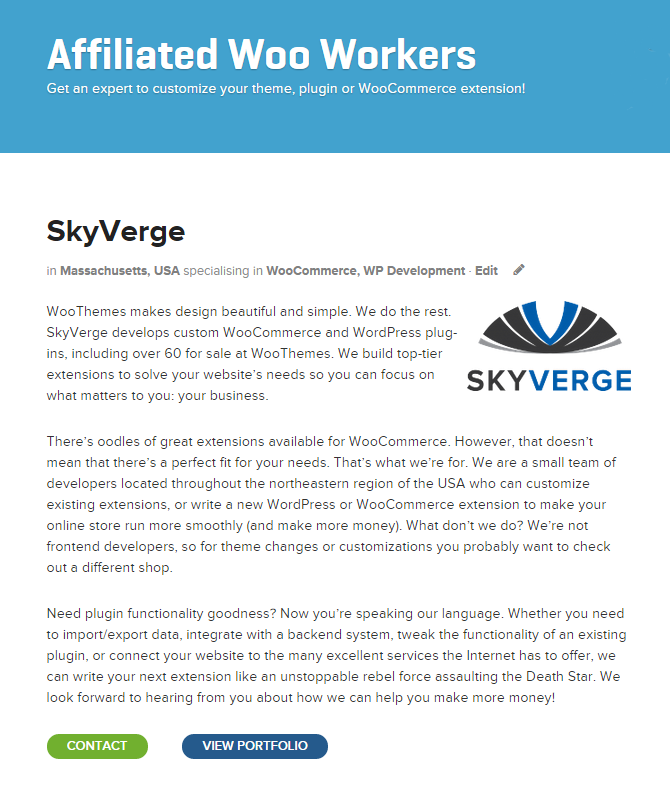 All WooExperts should have a full description of the services being offered so we can better refer customers to companies that make sense to them. Interesting! What does the qualification process look like beyond the yearly fee? I like the fee as a pre-qualifier, but is there a difference between Gold, Silver, and Standard beyond the yearly? Hi Robby. It’ll depend on the services being offered. A few of the things we look at is if you’ve developed plugins, code review, ticket history, adhering by WordPress GPL, where you’re based, number of WooCommerce sites built or experience with, and many other things. Any ideas as to how long the verification / qualification process takes? We applied a couple weeks ago and haven’t heard anything back. No email confirmation that our request was received. No replies to our support tickets either. 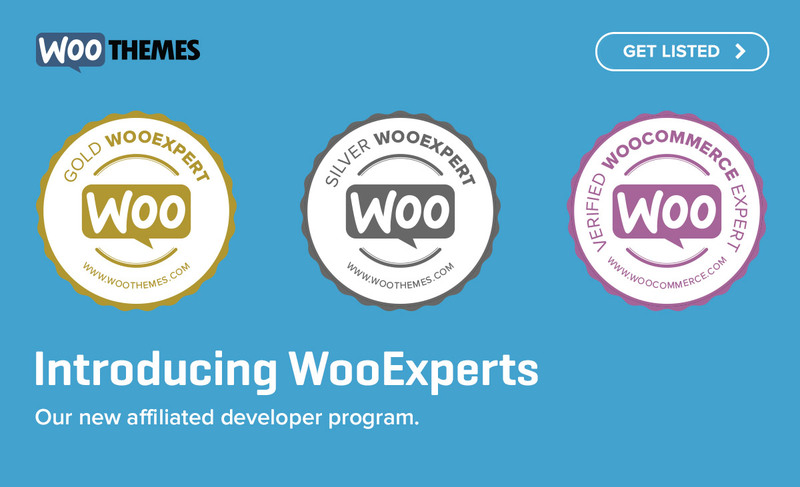 I think it’s great that you have an actual program now with official badges, but I’m curious as to what value the different expert levels give to Woo customers? The only difference I see now between the badge levels are the amount experts have to pay in order to get them. Other than that, is gold really any better for a Woo customer than standard? I would have loved to have seen levels based on certain criteria (# of customers/projects, quality of code, review/rating averages, size of projects, test scores, etc.). We have been waiting for this to happen and cannot wait to partner up. We submitted the form to apply for the program a few weeks ago but we haven’t heard anything back. What’s your average review time? Thanks! Big demand for WooCommerce experts. Great opportunity for Developers who love WooCommerce to specialise and get more exposure.